Alarmed by the prospect of Earth’s inhabitants spreading their ruinous ways to the stars, David Louis Sussman offers a blunt summary of the disastrous impact “this rogue species” has already had on our own planet in his book, The Cosmic Cancer. 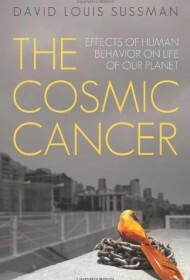 Human beings are his eponymous cosmic cancer: wasteful, violent, destructive, and so focused on short-term gratification that they refuse to acknowledge how close to the environmental and population abyss Earth is, because that would mean having to curb their reckless consumption and pollution of the world’s resources. His statistics are voluminous and depressing, ranging from the amount of trash produced per person each day in America (4.4 pounds) to the number of people around the world who suffer from chronic hunger (842 million), and he cites authorities as venerable as Plato and as up-to-the-minute as Thomas Picketty to buttress his bleak view of human nature and the present state of affairs. It would be helpful, however, if the author were equally ready with statistics when making such sweeping statements as “increasing income spreads between ‘haves’ and ‘have-nots’ are a reflection of excessive world population,” or “politicians[’] allegiances have been locked in by global investors in return for support at the ballot box.” On the rare occasions when Sussman suggests solutions, they tend to be either weird (sports teams with names like “Podunk Polluters,” with proceeds from their games employed “for the benefit of the environment”), or unrealistic (a national review board to enforce ecologically sustainable product design). There’s no denying the chastening power of Sussman’s grim assessment of humanity’s selfish behavior, and readers may find themselves reluctantly concurring with his conclusion that the odds are basically 50-50 on whether humans or any other creatures on Earth can survive much further into the future. Nonetheless, the absence of concrete solutions makes this more of a jeremiad than a call to action.